2016 ACM Learning@Scale was a great success! Proceedings are availabe on ACM Digital library. Conference recordings are available on the official ACM youtube channel in the L@S'16 playlist. Videos are also viewable directly from the conference program page. We would like to announce that the 2017 Learning@Scale will be held at Massachusetts Institute of Technology, Cambridge, MA, USA. Stay tuned for the further updates! Big thank you to all Learning@Scale sponsors! Finally, we want to thank our generous sponsors for making this event possible and for showing their ongoing commitment to the Learning@Scale community and further development of this amazing field! Thank you once again! April 24, 2016: Learning@Scale is about to begin. You can access the live stream [here]. April 24, 2016: Learning@Scale proceedings available at ACM digital library [link]. April 18, 2016: The Learning@Scale digital component is now online. Please work through the digital resources prior to the flipped session on Tuesday. Feb 17, 2016: Deadline for camera-ready work-in-progress papers & demos is extended until Feb 22, 2016! Feb 17, 2016: Early registration extended until Feb 24, 2016! Jan 15, 2016: Conference registration is now open! 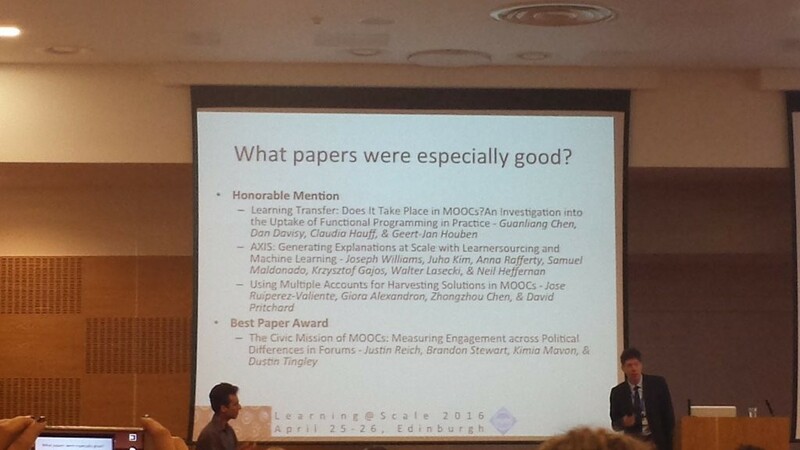 The third annual meeting of the ACM Conference on Learning at Scale will be held on April 25-26 at the University of Edinburgh, UK. This conference is intended to promote scientific exchange of interdisciplinary research at the intersection of the learning sciences and computer science. Inspired by the emergence of Massive Open Online Courses (MOOCs) and the accompanying huge shift in thinking about education, this conference was created by ACM as a new scholarly venue and key focal point for the review and presentation of the highest quality research on how learning and teaching can change and improve when done at scale. "Learning at Scale" refers to new approaches for students to learn and for teachers to teach, when engaging large numbers of students, either in a face-to-face setting or remotely, whether synchronous or asynchronous, with the requirement that the techniques involve large numbers of students (where "large" is preferably thousands of students, but can also apply to hundreds in in-person settings). Topics include, but are not limited to: Usability Studies, Tools for Automated Feedback and Grading, Learning Analytics, Analysis of Log Data, Studies of Application of Existing Learning Theory, Investigation of Student Behavior and Correlation with Learning Outcomes, New Learning and Teaching Techniques at Scale. All full papers accepted will be published in the ACM Digital Library as archival publications. While we encourage visionary and forward-looking papers, please only submit your best novel work as anonymized papers. The paper track will not accept work recently published or soon to be published in another conference or journal. However, to encourage exchange of ideas, such work can be submitted to the non-archival work-in-progress and demo track. For submissions of this kind, the authors should include the venue of previous or concurrent publication. L@S takes place right before LAK2016 and shares the same venue.